The Peoples March – let them know! Recently I’ve been fairly quiet on my blog and social media. This is partly down to the workload for sixth form that’s taken away quite a lot of my free time, as well as something exciting that I’ll be sharing hopefully within the next few weeks or months. Anyway, something that I’m really looking forward to is this weekend. For those of you who don’t know, from the 30th November until the 11th December it will be the Paris climate conference and this upcoming weekend events will be taking place all round the UK to mark the start of the talks as well as emphasising that we’re standing for a positive change and outcome. Climate change is an issue that is very controversial, but in quite different ways and for a number of reasons. Quite often I come across those who are climate change sceptics. This may be down to the fact that they believe it’s a natural occurrence, it isn’t that big a risk or perhaps it’s just easier to ignore so it’s not a worry and their lifestyle isn’t effected. As someone who is prepared to stick out and do what I can , it’s quite overwhelming. There’s so many different causes and aspects to it. From pension divestment into none renewable energy to the impacts from the food we eat. So for someone who has a busy lifestyle and has many different things to focus on which aren’t exactly effected by climate change, it doesn’t really cross their mind and I suppose they don’t see that ‘duty’ of doing something. As well as this, in the world today there are a lot of problems. You turn on the news and in the last few weeks it’s been very full on, from ISIS and air strikes to the NHS and junior doctors. These are all mainly short term issues which people believe will have an impact on their life and how they go about. Climate change is something that is considered long term, but what is not recognised is that it is all too quickly becoming a short term issue. When I was younger, I think I remember hearing about climate change in one of my geography lessons. It’s something that is mentioned due to it’s effects. In fact in my last A level geography lesson just last week we were learning about how climate change is having an effect on flooding, even here in the UK. A few weeks back I went to a climate event at a local town. There was a panel and debates went on, it was very good. The local MP turned up too so it was quite successful and there were some positive outcomes. Whilst sitting there, after all the panel members had spoken, there were some questions from the floor. One of which was a young girl who was a year older then me. She spoke about similar points that I would make, for example young people’s attitudes, what’s going on in schools and the effects it’s going to have on her generation in years to come. After she spoke, I did too and I thought it was only right to elaborate on what she’d said and to show that young people are there and that the future matters. For the next 10-20 minutes, there were plenty more comments from other floor members. Anyway, the younger generations do care about the planet. Why wouldn’t they? It’s the one they’re going to grow up on! But for many, this comes after they’re educated and made aware of what’s happening. To me, climate change is also something that questions the idea of leadership. We can all do our little bit to decrease our impact but there’s only so far. For example, you can’t exactly control where your everyday appliances come from or how they were manufactured. You can to a certain extent by not buying them or buying the best options but for many that may become too expensive or they simply can’t live without them. Therefore this is when the step of authority and leadership comes in so there’s stricter regulations and impacts to the environment aren’t as bad. This example is small scale but overall the message I’m trying to make, from this odd example, is that it’s everywhere. However, on the other hand, anyone can lobby, push, encourage governments, leaders etc to take a step and make changes that will have a much larger impact. Being someone who’s interested in wildlife, it’s difficult to ignore the impacts from climate change. Whether that be here in the UK or much further afield. From the species who are loosing their habitats to those that are changing their behaviour to adapt. This was one of the main reasons how I became so aware of the issue, from this I researched and found that it’s not just something that is threatening wildlife and the natural world but people and many different aspects of the planet. As I mentioned, this weekend events will be taking place all around the UK and I’m off to London on Sunday! 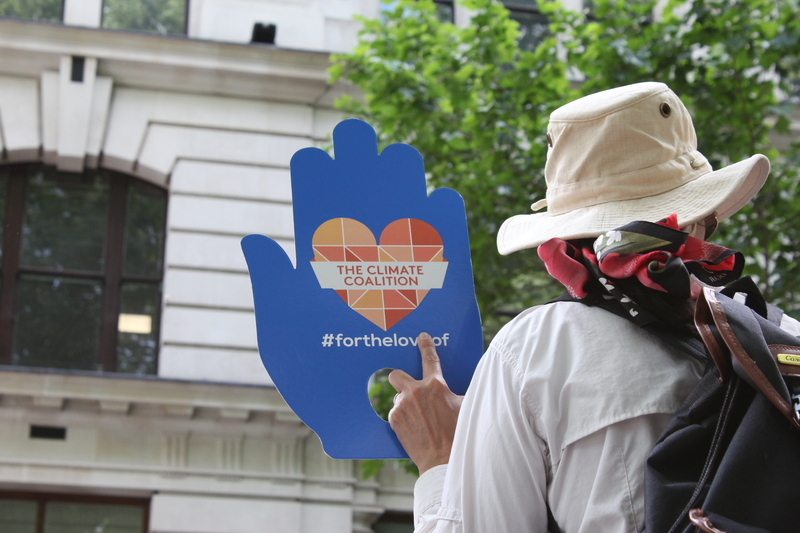 Taken at the #fortheloveof Peoples March back in June. I’ll be marching in Liverpool, Georgia, so I won’t see you in London, but we’ll be united in spirit. It’s so important that your generation stands up to be counted. Far too many of my generation say that they care, but then don’t think that they should attempt to reduce their carbon emissions. Let’s use Sunday as a day to start looking at our carbon footprints and see how we can make them as small as possible. It might actually be fun!